Oliebollen/Oliekoeke or literally oily balls are traditional doughnuts made in Netherlands for New year's Eve. The yeasty dough has some chopped apples and raisins too, to make them more delicious and to count them into one of the healthy snacks, but the name says it otherwise. Soak raisins in warm water for 20 minutes. Wash and chop the apples into bite-size pieces. In a large bowl, take flour, sugar, salt, lemon zest and yeast together. Stir well to combine. Add chopped apples and raisins to this and whisk well. Warm milk and add butter to it. Now add this warm milk to the flour mix. The milk need to be warm not hot. Mix the batter using a spatula to get a homogeneous mixture. Let this batter rest for an hour or until it doubles in volume. Heat oil for deep frying, when the oil is ready, (i,e) when a drop of batter dropped into the hot oil, sizzles up fast, wet your hands, using your fingers, scoop a spoonful of batter and drop it into hot oil and deep fry them until golden brown. Keep the flame in medium while doing so. Do not crowd the pan while deep frying. I fried 4 at a time. Serve the doughnuts warm with powdered sugar sprinkled on top. You have found such unique recipes for donutnuts. Nice. 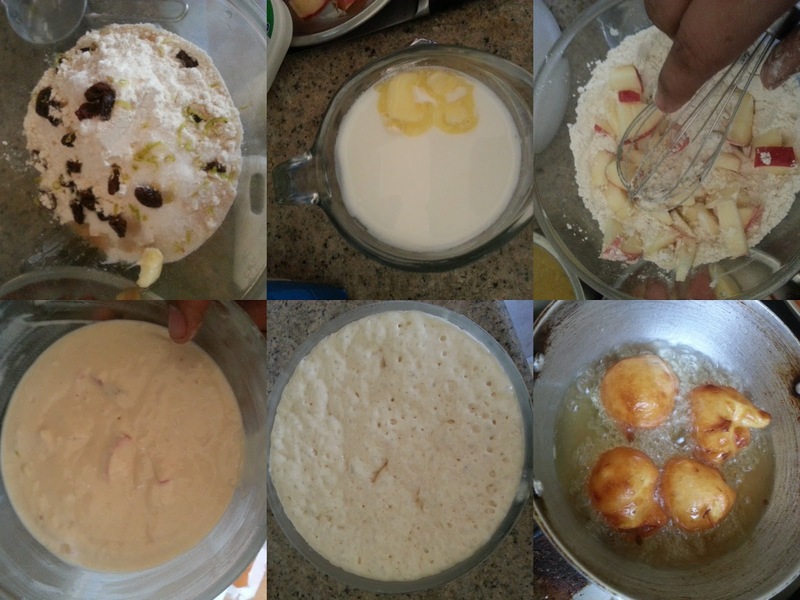 Very nice recipe Priya..the click looks tempting! Lovely click Priya!! Oliebollen looks tempting!! How spongy they are, i can munch couple of them rite now. Love the addition of apples and raisins to donuts. They look super tempting. Wow! Apples in Donuts is unique! That looks awesome! Love the apples in the doughnuts.